This article is for guides about Shogo: Mobile Armour Division. 3.1 Installing on regular GNU/Linux Systems. 3.2 Installing on 64-bit GNU/Linux systems (x86_64). 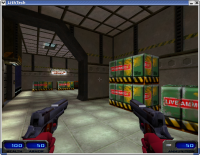 MPKFA - Full Ammunition, Armour, and Health (Cheat a reference to "IDKFA" from Doom). MPGOD - "God" Mode, makes your immortal. MPPOS - Turn on and off the "Show Position" feature. MPMECH - Change your MCA model. (Changes you to "Child Sanjuro" if on-foot). MPONFOOT - Change into On-Foot mode. MPBIGGUNS - Gives all characters ludicrously oversized weapon models, like the hilariously gigantic Juggernaut carried by Uziel. MPCLIP - Turns on "No Clip" mode, allows you to walk through walls and objects. MPCAMERA - Turns on and off the "Camera" feature. MPLIGHTSCAPE - Turns on and off the "Light Scape" feature. MPANIME - "Makes the explosions look more like Japanese anime", whatever that means. MPTELEPORT - Teleport back to the starting position. MPVEHICLE - Use a Vehicle. MPBOYISUCK - Kill All Enemies. MPTRIGGERS - Cubes show Actions. This guide will teach you how to install the Microsoft Windows shareware version of Shogo from the official Monolith Productions website. Run the installation file and read through the options. Click on the Shogo icon on the desktop or "Start Menu". Installing on regular GNU/Linux Systems. 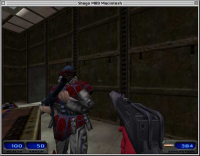 This guide will teach you how to install the GNU/Linux (Unix-like compatible) shareware version of Shogo from Hyperion Entertainment. Download the demo shell script installer. Run the installation file by typing "sh ShogoDemo.run" into the terminal, and read through the options. Installing on 64-bit GNU/Linux systems (x86_64). Make sure you have the 32-bit compatibility libraries for your distribution. These usually add the "linux32" command (necessary to run the installer). Most likely they are already part of your distribution. In Fedora, support comes from util-linux-ng (core component package), others may vary. Consult your distribution's documentation to find out whether you already have this support or if you should add it, and how. In order to prevent an architecture mismatch, and be able to successfully install Shogo, when running the installer use this command instead: "linux32 sh ShogoDemo.run", this will fool the installer into thinking it is installing onto an i686 GNU/Linux system. Follow the prompts and when finished, you shouldn't need the "linux32" command to launch the game. When installing the full version you will be asked to enter registration information, this includes a Serial Number (CDKey). DO NOT SKIP, when they say you won't be able to play the game if you don't fill out the form, they're not kidding! If you get this when trying to run the installer, place this "export _POSIX2_VERSION=199209" into the terminal, press enter and then run the installer. After you are finished, put this into the terminal "unset _POSIX2_VERSION" and then you are done. Download the Shogo-Libraries.tar.gz archive and extract the files to your Shogo install directory. This will provide you with period libraries that should help the Shogo binary launch on modern Linux distributions. This guide will teach you how to install the AmigaOS shareware version of Shogo from Hyperion Entertainment. This guide will teach you how to install the Apple Macintosh shareware version of Shogo from Hyperion Entertainment. Go to your Shogo directory ("/usr/local/games/shogo" by default for the full version on GNU/Linux) and load up "autoexec.cfg" in a text editor. Find the "TextureDetail" line, and change the settings (For example, change it to 20.000000). Then start Shogo, and you should see an improvement in texture quality. 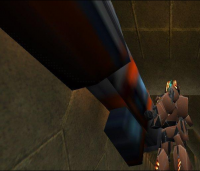 The game can tend to run too fast on modern systems, which can cause the game to be become more difficult due to faster enemy reaction times and can cause characters to start cutting each other off during dialogue sequences. To solve this problem you can cap the games's FPS by editing the autoexec.cfg found in your Shogo directory (by default /usr/local/games/shogo on Linux) and adding the line "MaxFPS" "30" or "MaxFPS" "50" depending on your preference. Alternatively on Linux systems you can also just edit the configuration for your own user account by editing the autoexec.cfg located in the ~/.hyperion/Shogo directory. This does not affect other users and does not require root privileges. Proceed down the rocky path, killing all the soldiers, when the escape ship comes down head for the front of it. Collect your ID off the nightstand as Kathryn informs you. Head for Regional Diagnostics (a good land mark is a stair case) and press all the terminals. This is optional but recommended. Go back down the stairs and find a door marked "Sec. 56", then walk up to the two guards and the tram track. Open the door, walk up the stairs and head around and meet the Admiral. Once he tells you your mission go down the other hallway, past the lockers towards some switches. As Kathryn tells you, pull the switches to learn more about the MCAs and them open them up to you. Choose your MCA and head around back, go through your selection's compartment door and then into it.